Sebastian Vettel topped the times for the first time this weekend after lagging largely behind in yesterday's wet sessions. Fernando Alonso dominated the session but was improved in the last minute by just 0.063s. 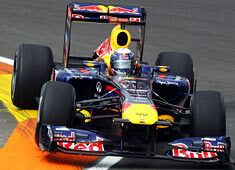 Mark Webber set the third fastest time. Felipe Massa's fourth fastest time raises the suspicion that Ferrari benefits from the changed blown diffuser regulations. Pastor Maldonado is 5th and a second off Vettel's pace,ahead of Button, Kobayashi, Rosberg, Pérez and Di Resta.